When Will The Boeing 777X Come Into Service? Boeing installed the engines on its first 777X flight test aircraft earlier this month. The aircraft is scheduled to roll out in February, and its first test flight is expected to take place in the second quarter of this year. We are looking forward to seeing the Boeing 777X in the sky soon. Photo: Boeing. All aircraft must go through extensive flight tests before they are certified. They are operated in conditions that are frequently more extreme than the ones they will encounter in revenue service. The aircraft are tested all over the world. Boeing’s flight tests typically include simulations of a variety of failures, as well as takeoffs and landings at low and high elevations, extremely cold and extremely hot temperatures, and in high winds. The 777X’s GE9X engine has already passed its first flight test. Last March, a GE9X engine was mounted to a specially designed pylon on a Boeing 747 replacing one of its engines. This test was successful, and now the first flight test of the aircraft is just around the corner. 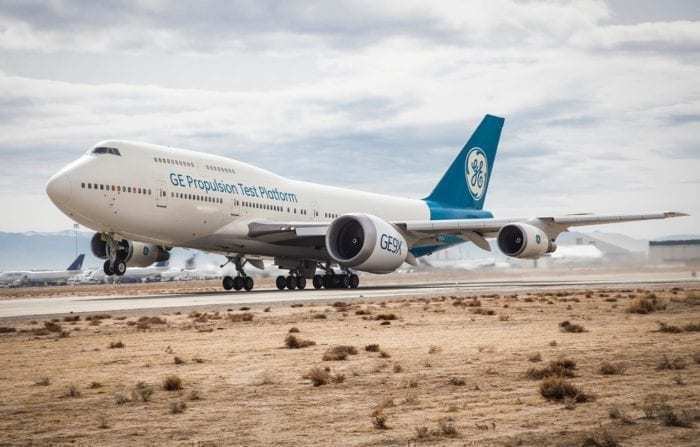 The first flight test of the GE9X engine was conducted over the Mojave Desert. Photo: GE. With all this testing coming up, when can we expect the Boeing 777X to come into service? Originally, Lufthansa was slated to be the launch customer of the 777X. However, things have changed, and the first 777X aircraft is expected to be delivered to Emirates in mid-2020. Accordingly, we are likely to see it put into service in the second half of 2020. Currently, Emirates is the largest 777X customer. It has placed orders for a total of 150 aircraft. In addition to Emirates, ANA, Cathay Pacific, Etihad Airways, Lufthansa, Qatar Airways, and Singapore Airlines have ordered the aircraft. Nonetheless, the last orders for the aircraft were placed by Singapore Airlines back in 2017. 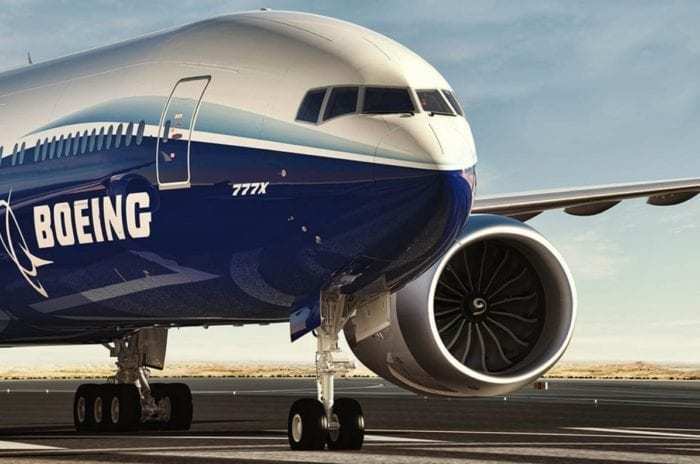 Even though other airlines are reportedly considering the purchase of the aircraft, no additional orders have been received by Boeing. The Boeing 777X will be Boeing’s largest twin-engine aircraft. It will feature composite wings with folding wingtips. The folding wingtips are necessary due to the aircraft’s large wingspan of 235 feet. Furthermore, the world’s largest turbofan engine will be installed on the aircraft. GE Aviation’s GE9X engine is about the same size as the fuselage of a Boeing 737. It is the most fuel-efficient engine produced by GE to date. The composite fan of the GE9X engines is more than 11 feet in diameter. Photo: Boeing. The 777X-8 has a range of 8,700 nm and 350-375 seats in a 2-class configuration. The 777X-9 has a range of 7,600 nm and 400-425 seats in a 2-class configuration. The list price of the aircraft is $360.5 million and $388.7 million respectively. Additionally, as Simple Flying has reported previously, the 777X’s interior will be open and airy. Due to its capacity, range, and fuel efficiency, the aircraft will be perfect for high-demand, long-haul routes. We are definitely looking forward to its entry into service next year. Are you looking forward to the 777X? Looking forward to the first test flight of the awesome-looking aircraft. Gaining more 777X orders is a critical phase at this time for the Boeing mega-builder. The initial customers like Emirates have a dog in the 777X engineering fight. 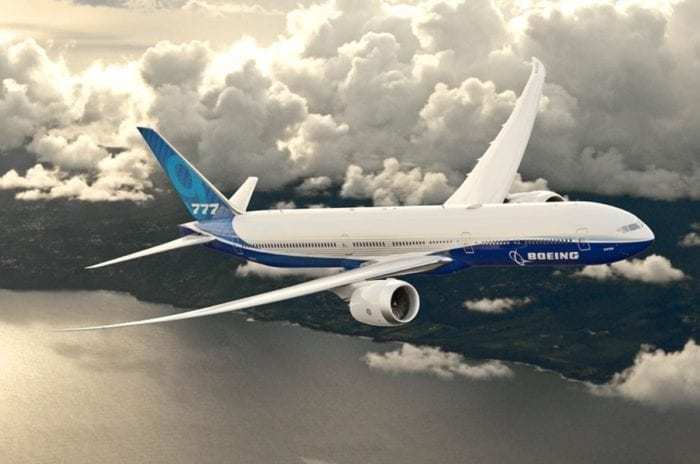 Those who sign on to 777X orders during the Paris with Boeing become second tier customer where its inputs will be limited customer products for its customers like the wifi or sound systems could offer by customer Choice. A special class of customers comes from the launch customer who has partnered with Boeing for making the 777X designed around a launch customers requirements. Using Emirate as an example, showing interest after first launch announcement its special conditions request move the airline into the same room of launch customers could insist on larger window shades or designs and all 777X. As it may be a second tier customer who may sign for an impactful order but special airplane considerations from that customers may only be in the second tier launch but as a special customer for its Project Sunrise program from a Qantas program partnership This seems to benefit airlines who are not playing one against other in the aviation market place . There is often a lull in orders between launch customers and entry into service. This happened with the 737Max – the A320 NEO was outselling it 5:1, until Max began airline service. Since entry into service, don’t know if any one has kept score from that point, but have a feeling 737 Max orders have at least equalled, if not beaten the 320 NEO for new orders. This despite the Lion Air disaster. So many potential customers like to ‘wait and see’ how a new type actually fleshes out, in the real action. I think this will happen with the 777X. It is really in a market all of its own. if you think back to the recent 737 max crashes, they were using a different more efficient style of the 737 plane, the same thing goes with the Boeing 777 and It is probably correct that the 777x and 737 max will be fairly similar. It feels that Boeing is going through each of its planes one by one and upgrading them in the same way as they did to the 737. The new 777 plane probably uses the same technology as the 737 Max and they will obviously have to fix it to before the 777x becomes the new 737 max and that will cause a delay.